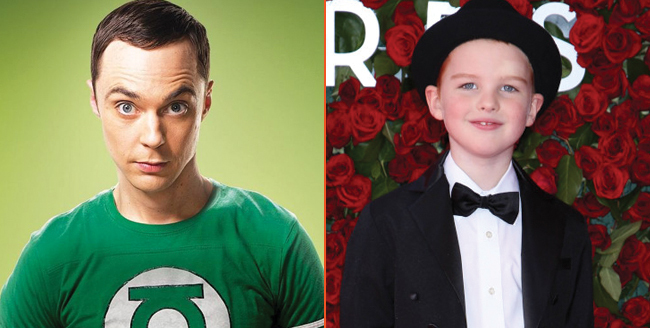 In what’s shaping up to be a busy, busy day for TV casting (see: Mayans MC, The Inhumans, Gotham and Fox’s untitled X-Men pilot), Variety is reporting that Iain Armitage is circling the role of young Sheldon Cooper in CBS’ embryonic Big Bang prequel series. Bearing the title Sheldon, the spinoff is yet to land a pilot order from CBS at press time, but it’s understood the network and Warner Bros. are currently in the process of hammering out tentative plans for a 13-episode inaugural season. Those plans may well involve Zoe Perry, too, who is said to be in negotiations to play Sheldon’s mother. Incidentally, on The Big Bang Theory, Perry’s real-life mother Laurie Metcalf played the part of Mama Sheldon across a total of 11 episodes, and even nabbed an Emmy nomination for her performance. Talk about keeping things in the family. Variety goes on to note that CBS is still casting the net in search of an actor to play Sheldon’s father. Nothing to report on that front just yet, but we’ll keep you posted if and when the network makes an announcement. What we do know is that Big Bang co-creator Chuck Lorre and current showrunner Steve Molaro are involved behind the scenes, while Jim Parsons, who so brilliantly ensured Sheldon Cooper became a household name in the original series, will executive produce. In news relating to Lorre’s beloved comedy sitcom, Warner Bros. and CBS are reportedly nearing a two-year renewal deal for The Big Bang Theory. A contract stalemate involving Mayim Bialik and Melissa Rauch is said to be the reason behind the slight delay, though we’ll keep you updated as this story unfolds.